So you have a bike and you would want to use it for commuting to your office? Or perhaps for doing your groceries and running errands. Here is how you should setup your backpack. If you are one of those guys who sweat very less, any backpack will do. In case you belong to the other group, you can buy backpacks with ventilation. I have a Quechua Forclaz 22 and the support design allows airflow on my back during a ride. 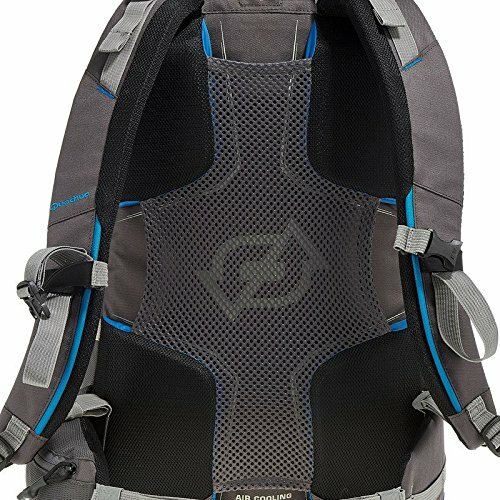 I wouldn’t suggest MTB style backpacks as they would sit snuggly on your back and most will not have space to carry a laptop. The wire-mesh and the space allows ample airflow to prevent sweating. 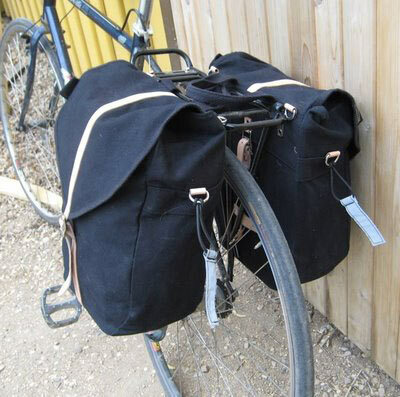 If you have eyelets for pannier on your cycle, you can carry your stuff in pannier. It might be a good options to offload the weight from your shoulders. You might want to consider this option if you are travelling distances in excess of 20 kms. Backpacks do have a small advantage. You don’t need to worry about equaling the weights of the panniers on either side. Also, most cycles I see on the roads of Bangalore are entry level MTBs and usually lack these attachment points. Tools are necessary to help you get back on the bike in case of emergency. Much can be avoided if you should do some basic checks every time before riding. That being said, we all know the golden truth about riding a bicycle – puncture is inevitable. The first two items are there to aid you in fixing small mechanical issues. In case of a major upset, they can aid you to temporarily address the problem so that you can take your cycle to a repair shop. The rest four are there to aid you in case you encounter the golden truth! It might be beneficial to spend some extra bit on good quality, puncture resistant tyres and tubes. I became very proficient in patching my tubes until I decided to replace my stock tyres with Schwalbe Delta Cruisers. It has been two years since then that I did not have to take out my tyre levers. Yet, I always keep them in my backpack in case I am reminded of the golden truth of cycling. I once rode a borrowed GT Traffic 2.0. The person who gave it to me had fitted the wheels with some cheap, Chinese tubes. One fine day, after the office, I found the rear tyre deflated. I knew that it was a puncture. When I dismantled the tube, I was shocked to find a gaping hole. It was too big for a repair patch. Thankfully, I was able to buy a spare tube because there is a Decathlon store right beside my office. I put the tubes on by myself, right outside the store, because Decathlon doesn’t service cycles that are not distributed by them. Moral of the story – carry a spare tube and know how to fit it on the wheels. Use good quality tubes. Cheap Chinese products can put you in a soup. This cannot be patched. 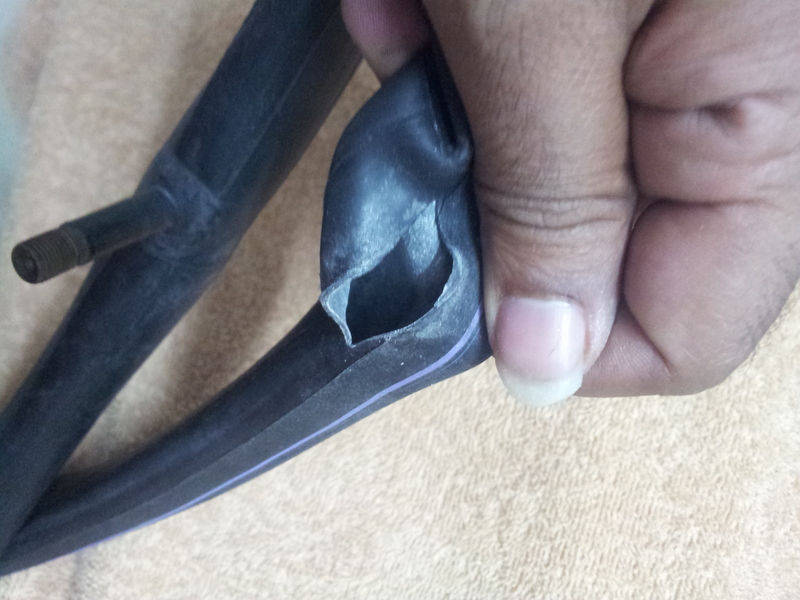 That’s why you should keep a spare tube in your bag. I use a Quechua Raincut and a Quechua rainproof lower for commuting in the rains. (They also double up as two important items when I travel/hike/backpack.) Any good two-piece rain gear would do. I have bought a larger sized one so that I can wear it over my backpack. The Forclaz backpacks do come with integrated rain covers but I have found this method to be simpler. Also, it protects the straps from rain. Top L-R: Cable ties, Hand pump, pair of tyre levers, Patch kit, Multitool. 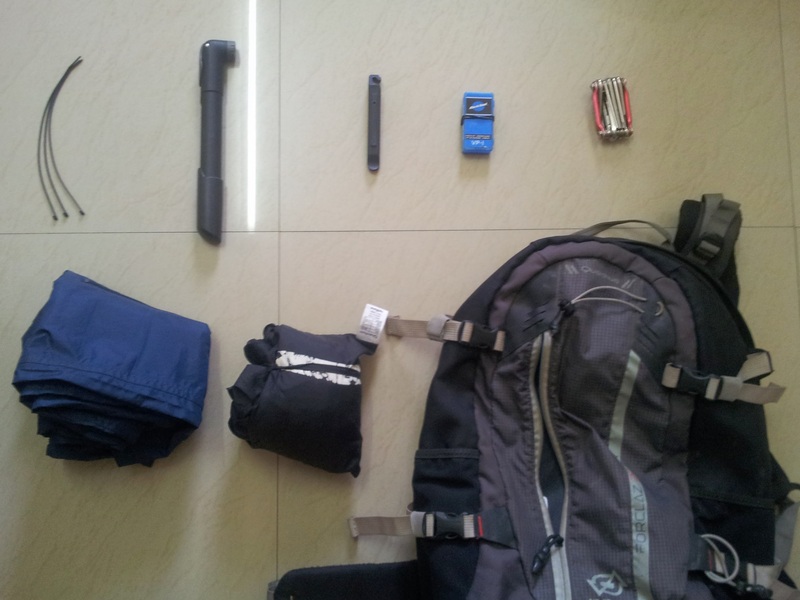 Bottom L-R: Rainproof lower trousers, Rainjacket, Backpack. Notice that I don’t carry a spare tube. The commute distance is less and I have a Decathlon store nearby. The raincoat is also useful after the rains. Firstly, you are protected in case the rainfall resumes; and secondly, when a passing vehicle wants to have a bit of fun splashing water from the water logged roads of Bangalore, you are well armoured to defend yourself. It might also be beneficial to store a pair of waterproof sandals in your office drawer in case the random rain clouds of Bangalore decides to unload themselves on the exact main and exact cross in which your office is located and you don’t want to wet your shoes. Alternatively, you can always keep a pair of waterproof sandals in your backpack. This is something that I do during the rainy season.